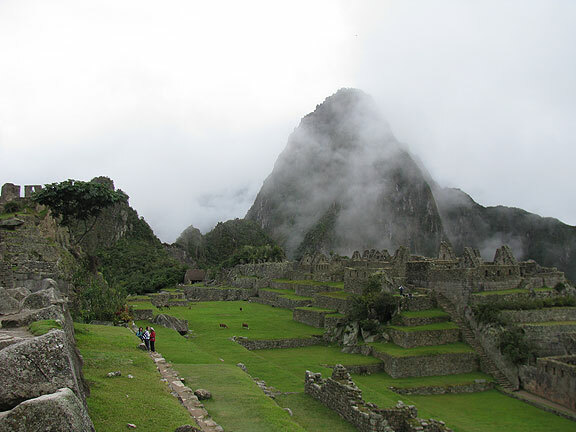 The iconic view of Machu Picchu, amidst swirling clouds, March 12, 2011. 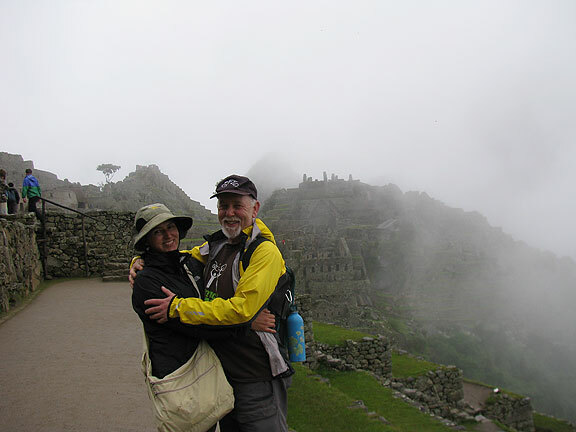 As noted at the end of the last post, we hiked to Machu Picchu in dense fog amidst dense crowds. All 500 of us that had official permits to visit the historic site on this day were lined up at the gate, which opened at 6:30 a.m. and off we went. It was a super easy hike compared to the previous three days, only an hour and a half or so to get to the fogged-in “Sun Gate,” followed by another 20 minutes of hiking along in the clouds before we came to the end. Still couldn’t see much, but then we did a zig-zag down to the official entry point, a modern Park facility with bathrooms and storage and gift shop and adjacent fancy hotel and restaurant, and nearby bus stop where a fleet of shuttles goes up and down the 2,000 feet from Aguascalientes (or “Machu Picchu city”) below continuously all day. We went in and through a small passage in a wall and suddenly we were there! This is a few steps inside the main entry point. 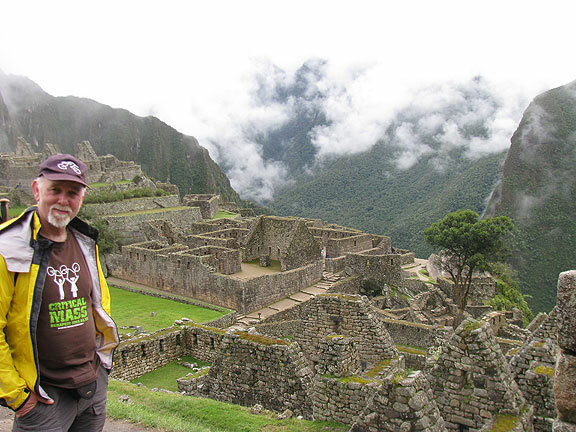 After three+ days on the Inca Trail it felt great to have made it! Eric kept us together as a group for the next two hours, taking us on a guided tour of the whole place, in and out of the famous sites, the Sun Temple, the sundial, the quarry, and much more. 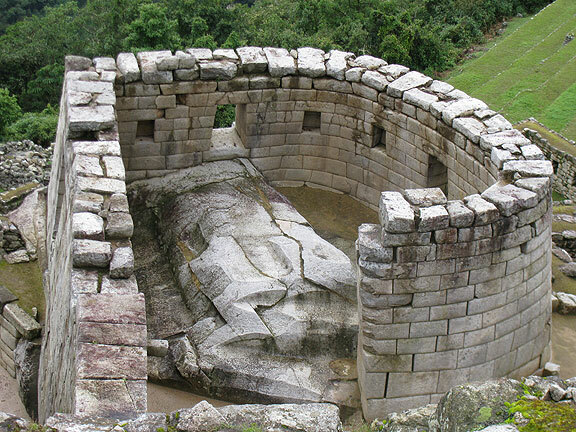 Having been prepared by the previous ruins and before that the amazing sites in Cuzco and even earlier in Ingapirca in Ecuador, it was sweet to have the climax be so well contextualized. 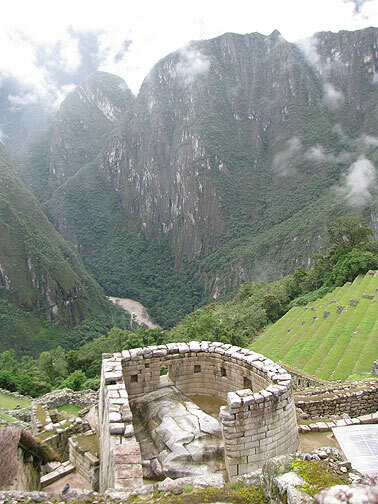 This is the Sun Temple from above, with the Urubamba River far below. 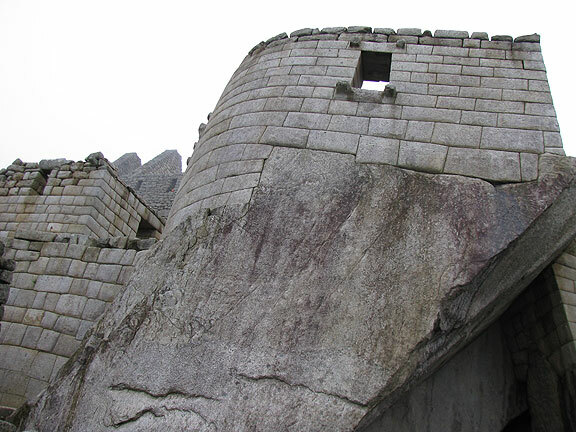 The Sun Temple from the side, perched on a massive granite platform, showing the fine stonework we'd become accustomed to in Inca architecture. 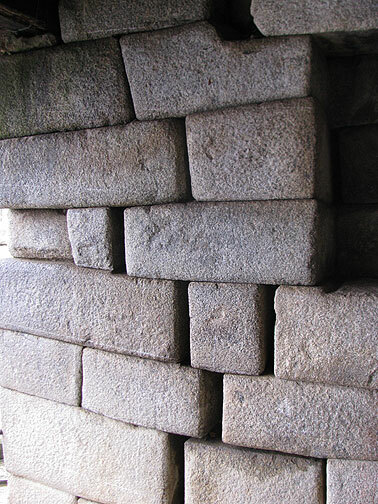 Top view of Sun Temple, close-up. 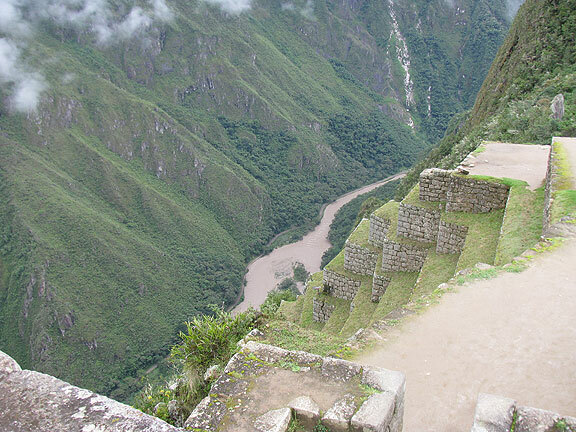 Incredible place to stand, on top of the High Andes, the river so far below, trying to imagine Hyram Bingham's experience of "discovering" Machu Picchu in 1912... loved how Eric always emphasized the historiographic irony of the idea of discovery. After Eric gave us the tour we had a few hours to wander around but of course by then the place was filling up with the hundreds of tourists who came in behind us from the Trail and the rest who took a train-and-bus to get there. Last "family portrait" of hiking group at the end. 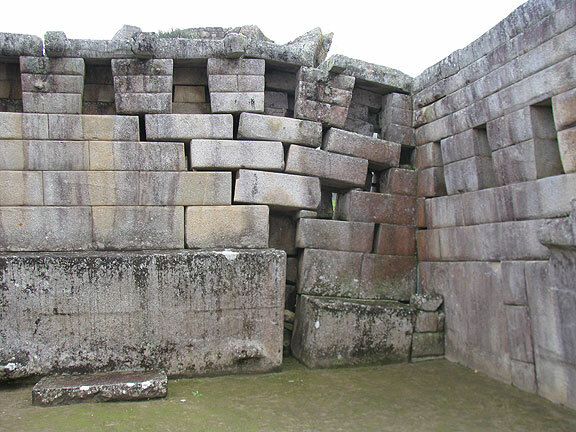 In spite of the brilliant anti-seismic stonework, the walls in some areas were clearly falling down after centuries of quakes. Surprising after that to see so many walls and doorways still perfectly intact and in good shape. 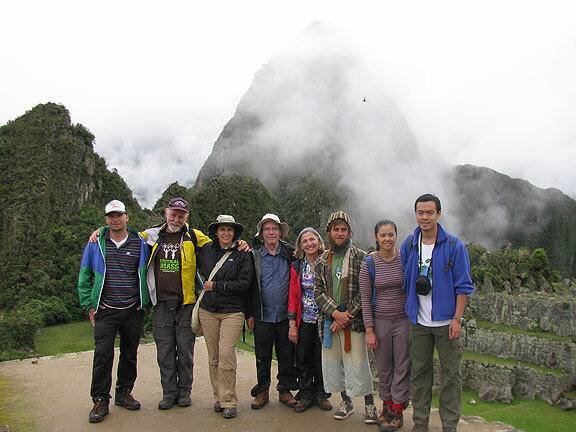 One of the surprises we learned about was related to this quarry on site. 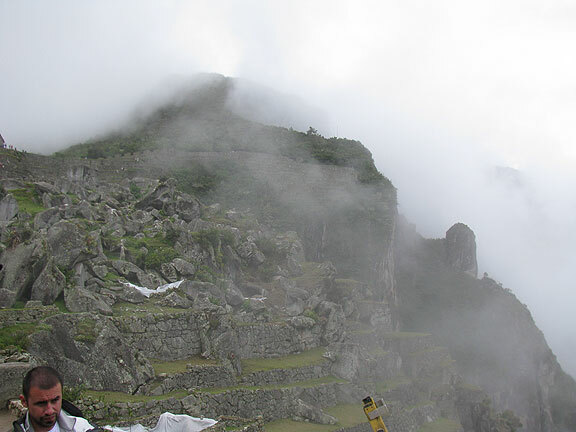 Eric argued that there was a lot of evidence that Machu Picchu was never finished, and this quarry was part of that. 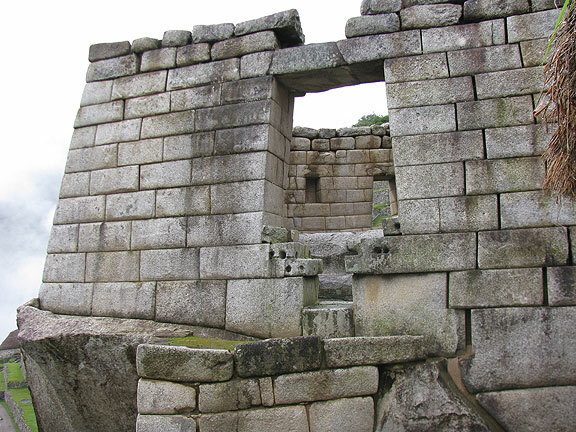 Several spots showed signs of having been left incomplete, like the inhabitants had abandoned the site rather suddenly, perhaps to retreat further into the mountains from the encroaching Spanish (who never found this mountaintop center). 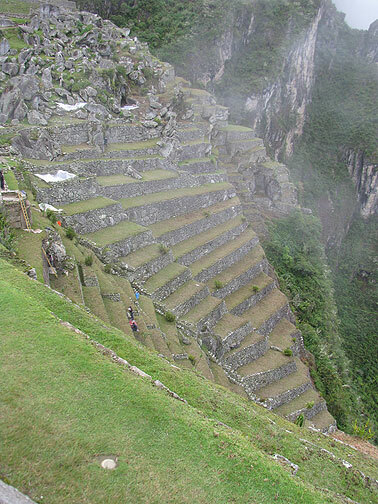 Here's the quarry again, above the incredibly precipitous terraces. 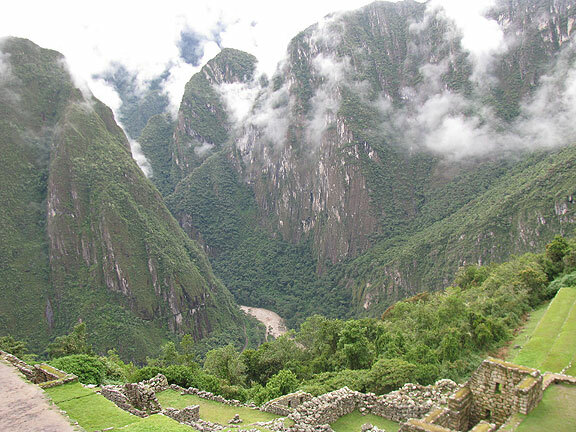 Another view down to the Urubamba which wraps around the mountain on which Machu Picchu sits. 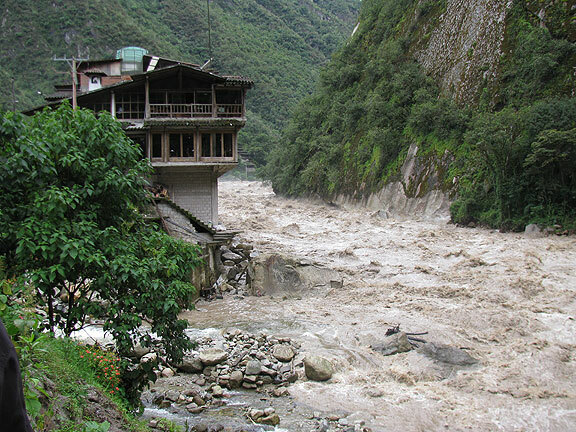 This view of the river is in the opposite direction. After a while we were tired from rising at 4:30 a.m. and went to find a friendly terrace on which to take a nap. 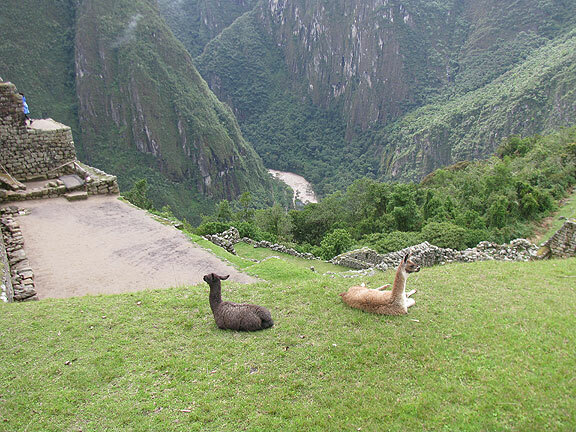 We slept for about a half hour before awaking to the sounds of chewing llamas, who had decided we were laying right in the middle of their lunch! Eventually we grabbed a shuttle bus and enjoyed the steep descent to the river at the bottom, and soon were in the town of Aguascalientes where we’d be catching a train in a few hours. We indulged ourselves in great massages, which probably saved us since the journey home was about 8 hours, and we had to get a bus at 7 a.m. the next morning for another 12 hours across the altiplano to get to Arequipa. 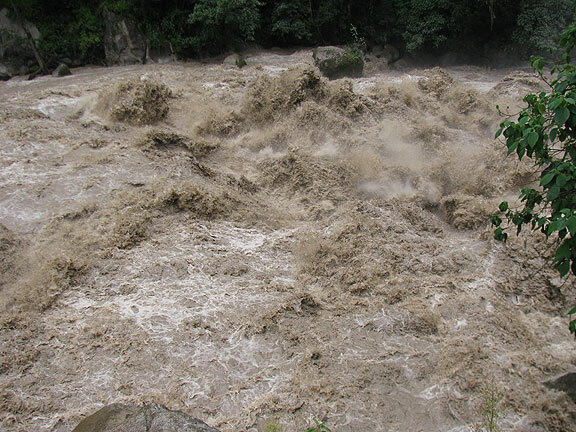 The Urubamba River, which we met at the outset, was waiting for us at the end too. Wow! I can't remember standing alongside such a violent river in my life. It makes your heart pound. 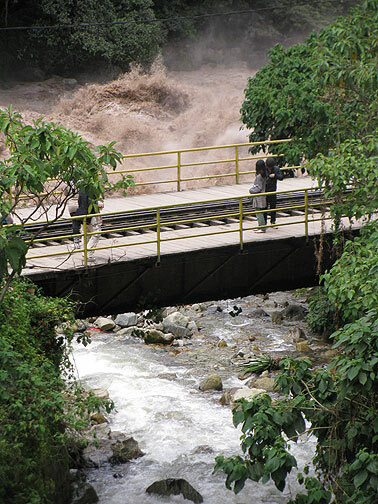 Here you can see the relatively clear creek from the town pouring into the muddy Urubamba. 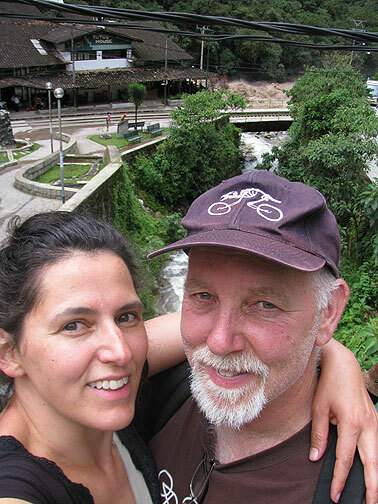 Post-massage, and off the Trail, we were quite happy! 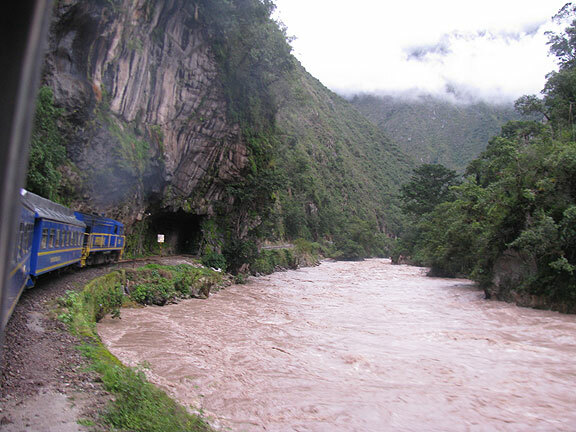 A couple of years ago the train was washed out by the raging river, but we made it back without any trouble, a gorgeous ride. Chris, what a great vicarious tour. I’ve always wanted to go.